Welcome to the home of 2K Project! Centomo to a cup contender? Billy Grahame on the move? Leap to XBOX 360 imminent! If NHL2K8 allows for custom conferencing this is what the league would look like. Cup4blues from sbfhl.net will be making jersey sets for all of the Create- A- Teams in 2K Project. Cup4blues has already begun work on the defunct teams Kansas City Cyclones and the Dakota North Stars as well as the Winnipeg Jets. 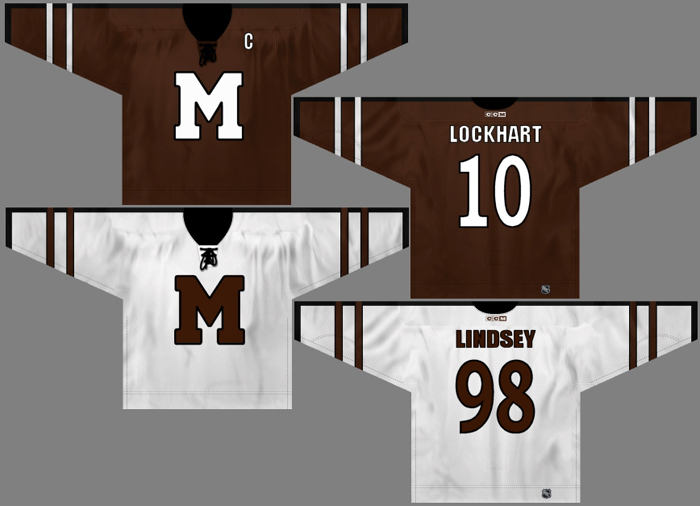 The Jerseys will have their own link once they have been completed. 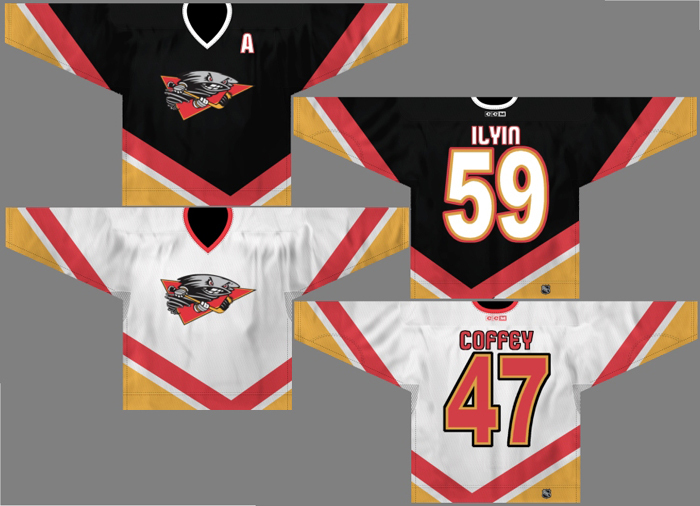 The other teams that will have custom jerseys will be Anchorage Mystery, St. John's Tide, Alberta Anarchy, Grand Rapids Prowlers and the Hamilton Toros. Here are a few of Cup4blues jersey sets. The newest team in 2K Project finally has a team logo. After much debating the Vikings decided on the logo above. 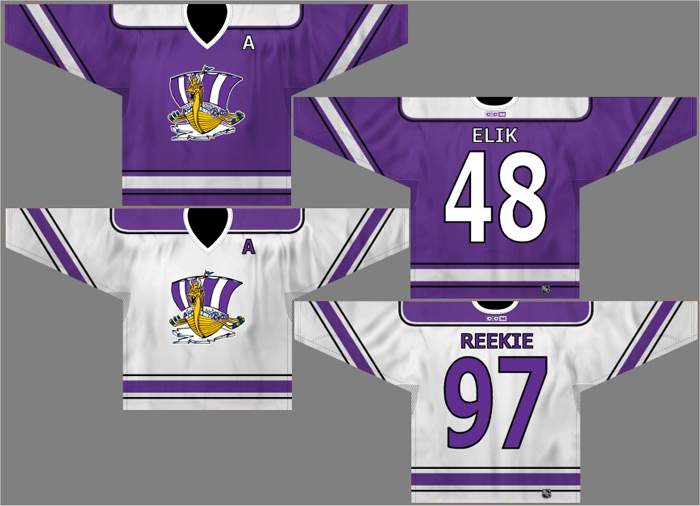 The logo features a viking-style sailing ship with hockey sticks out the sides as oars. 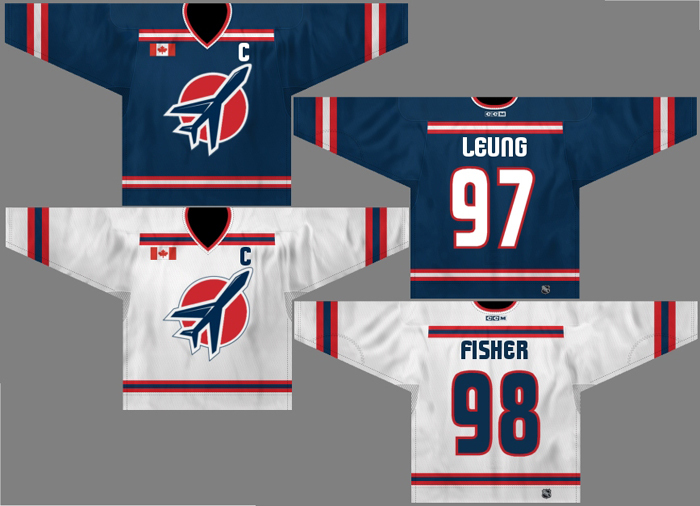 "We felt it stuck with both the NHL logo scheme and a sailing theme implied by our name," said the owners at the unveiling press conference. "The Victoria Vikings are proud to be part of the "New" NHL." The Vikings franchise was relocated from Florida and the Panthers name was dropped to adopt something that made a better fit for Victoria. The Florida Panthers franchise was in considerable trouble over the last few seasons before being bought by the new owners. The Vikings are the 2nd team to relocate in 2 seasons. For both teams unsuccesful seasons and or play were big reasons for franchise relocation, as well as financial difficulties brought on by failing fan-bases. 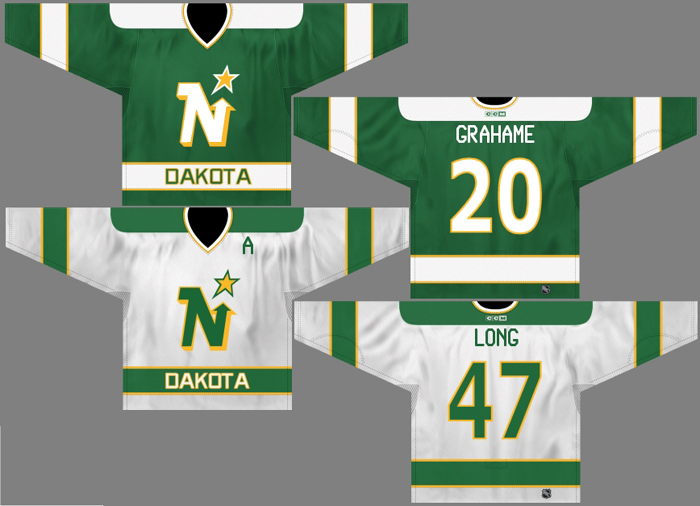 With 4 Stanley Cup appearances and zero cups to show for it the owners of the Dakota North Stars have had enough. With a roster jam-packed with all-stars Dakota has never been able to finish a playoff run. 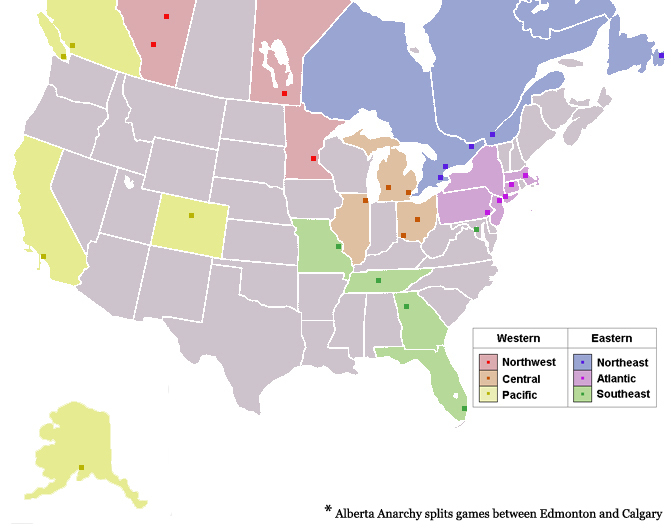 The North Stars have taken the finals the full 7 game stretch three times over the last thirteen seasons, blowing all three chances including coming back from a 3-0 game deficit against the Alberta Anarchy. Dakota who has finished first in their division more times than not over the last 10 seasons are also infamous for their 1st round playoff exits against much weaker teams. "We put in our time," said the former team owners. "We did as much as we could with the team; hopefully they have better luck elsewhere." The new owners will relocate the team to Hamilton, Ontario before the beginning of next season and they will also undergo a full team makeover, reemerging as the Hamilton Toros. "We wanted to go with something classic," stated the new team owners at a press conference. "We contacted the defunct World Hockey Association and purchased exclusive rights to the old Toronto Toros logo and team name. The NHL gave us the okay so as of right now the Hamilton Toros are simply waiting for the season to start. The Toronto Toro's franchise spent 6 seasons in the WHA as both the Toronto Toros and the Birmingham Bulls and were one of the WHA's most popular franchises. When the WHA merged with the NHL in 1979 the franchise was lost as the Oilers, Jets, Nordiques and Whalers merged with the NHL while the Bulls and the Stingers were left out of the merger. "Ontario is a big province," said the new owners. "The Maple Leafs are going to have some close competition with the Toros around." Hamilton is Canada's 8th largest metro area and other than Quebec City is the largest without an NHL franchise. Interestingly enough the newly relocated Toros were originally the Buffalo Sabres who used a buffalo logo on some of their jerseys representing the american city. Fittingly enough on the new Toros jerseys will be a bull which to some is an odd coincidence. The Hamilton Toros will begin play as soon as Season 41 is underway. Columbus slays a giant as Blue Jackets defeat Prowlers in 6 games! The Columbus Blue jackets shocked the hockey world as they defeated the back to back Stanley Cup Champions to end a 22- year long Finals drought in Columbus. In what will become another chapter in the story of a hot goaltender leading the team to a Stanley Cup victory, netminder Murray Kasparaitis did just that. After re-signing with Columbus for a 1 year deal, the 42 year old goalie certainly saved the best for last. Kasparaitis who played spent 25 seasons in the NHL with Pittsburgh, NY Islanders, Upper Peninsula, Anchorage and Detroit before coming to Columbus last season had never won a Cup; in fact Kasparaitis had never even been to the finals before this season. Kasparaitis tied for first place with Philippe Mendez for lowest GAA (2.22) during the regular season and also led the league with the highest save percentage (.927). But it wasn't just goaltending that led Columbus to the finals but also solid and dedicated defense. The Blue Jackets finished the season with the second lowest GA in the NHL with 187 while scoring a total of 242 GF. While those figures look great on paper you can't understand the true odds of this team unless it is pointed out that Columbus is the biggest underdog finals story the Florida Panthers went up against the Avalanche in 1996. With a rag-tag team of players with virtually no vetern playoff experience, save for the late season acquisition of 42- year old Winston McCormick; Columbus tore through the playoffs on will power alone. After defeating Dallas in 7 games, and then taking down the top notch defense of the Mystery in 7; Columbus went on to the conference finals. After a grueling first 2 rounds going the 7 game distance both times the Blue Jackets were able to defeat Chicago in only 5 games to make their way to the finals for the first time since Season 18. Coming into the Finals most everyone expected the Prowlers to make quick work of the Jackets as they had won the last two Stanley Cup finals in a row. With a roster overflowing with talent, the Prowlers had 6 skaters rated in the 90's to the Jackets single 90 rated skater. The offense of 26- year old Billy Grahame alone was enough pressure as he celebrated his 2nd straight season with 100+ goals, making him the only player in 2K Project history to hit the 100+ goal mark twice (the only other player to hit 100+ goals being S. McCormick). If the Prowlers had any over confidence going into the matchup the Jackets surely made them pay. After the Prowlers nabbed game 1 with a 3-1 victory it was all Jackets the rest of the way. Game 2 was the bloodiest of the series and the real momentum starter as both teams played a physical and hard-nosed game; but in the end Kasparaitis took the spotlight stopping 33 of 34 shots to tie the series at 1 each. Game 3 & 4 were all Jackets as Lucas Oakes of the Prowlers let in 6 goals and in the very following game Kasparaitis again came up huge stopping all 28 shots for the shutout taking the series 3-1 on the Prowlers. For a moment it looked as if the Prowlers had shifted momentum in Game 5 as 3 time Conn Smythe winner Lucas Oakes answered with a deciding shutout of his own; but in the end it was too little too late and Kasparaitis was just too hot. Back on home ice Kasparaitis took whatever steam was left out of the Prowlers as he made an amazing 37 saves to earn his second shutout of the contest to end the Prowlers dreams of 3 in a row. You couldn't have told the story any better if you had made it up, the Columbus Blue Jackets with a roster of virtually NHL no-names took down the hottest and most talent laden team the NHL had to offer. After being awarded with the Conn Smythe, Murray Kasparaitis announced his retirement in front of the home crowd. If there was anyone who retired on top it was certainly him.